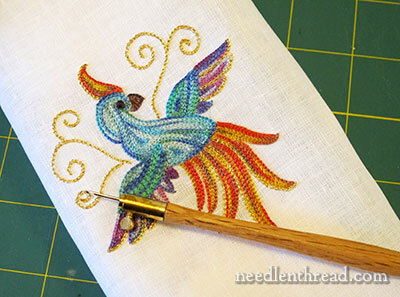 Gertrude McFuzz, The Tambour Work Bird – She’s Finished! Little Gertie McFuzz, the tambour work bird to whom I introduced you last week, didn’t take very long to finish. It just took me a long time to get around to writing about her again. When we first looked at Miss Gertie, her body had been tamboured in with Sulky Petite blendables, and I’d started on her wing and tail feathers. After finished the wing and tail feathers, I tamboured in that little crest on top, and that anomaly of a beak. The beak is worked in “milk chocolate” in the Sulky Blendables. The beak turned out looking like some strange flat leaf, but that’s because I blurbled when tracing the pattern. 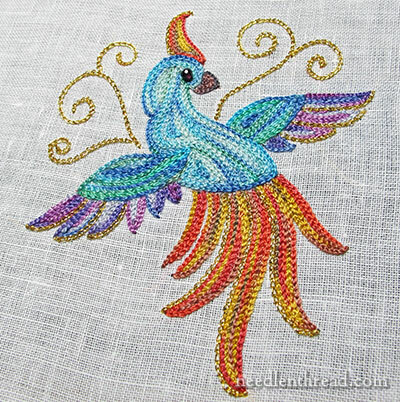 If you look at the original Little Bird of Paradise embroidery pattern available here for download, you can see that Gertie’s nose is not that unbecoming! Still, the lines were there, and they had to be covered. But the nose grew on me as I went a long – or at least, it didn’t bother me as much by the time the whole little piece was finished. I wasn’t planning to add any gold or anything fancy to this piece. After all, it’s a practice piece. 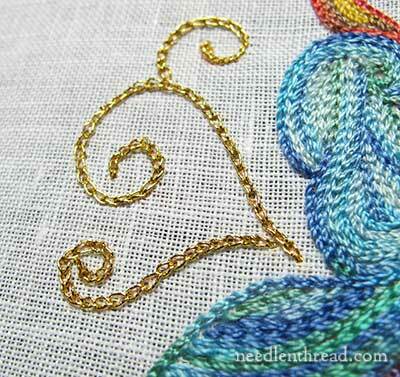 Why would I use a real goldwork thread on a practice exercise in tambour work? 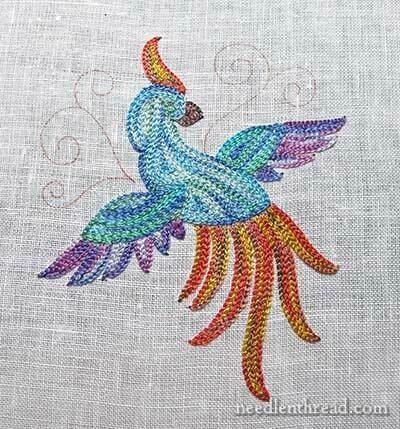 And it’s so easy to work with, using the tambour needle – easier than most other threads, including regular cotton. It just glides into the stitches, it doesn’t snag on the needle, it doesn’t separate, it just…. works. So, sacrilegious as it may seem to say this about a fine goldwork thread – even if you’re just starting to practice with the tambour needle, use some of this stuff! Once I worked the little scrollies in gold, I couldn’t stop there. You know how it is, when you’re working along, and really enjoying the process, the thread, the whole experience? And then it comes to an end? And there’s that deflating sense of disappointment? That’s what happened when the scrollies were finished. They took a whole of maybe 10 minutes. And then it was over! So I concocted new places to put the gold. After all, she’s just practice, right? I tipped out some of Gertie’s tail feathers in gold. It worked, but it’s not that noticeable because of the vivid yellows and oranges on the tail. So then I decided the gold had to be a wing thing, too. That worked better. The contrast between the purples and blues and the gold made the gold stand out a little. Then the crest got a wee touch of the gold as well. And I stepped back and thought – well, she looks ok.
But…. something was missing. She seemed to lack personality. Why was that? Oh! She needs an eye! A little bit of foraging…. …and a wee faceted amethyst bead. And that brought Gertie to life! Here’s a photo off the frame, in different lighting, with the tambour hook to give you some idea of size. She’s not too large, our little Gertie. And that’s the end of that practice piece. I hope you enjoyed seeing it! 1.Tambour needle- they’re available through Lacis. 2. Shadow work linen – you can find it through Needle in a Haystack. I used an 8″ square. You can also use handkerchief weight linen. 4. #7 gold tambour thread – available through shops that carry needlework goods from Access Commodities. If they don’t stock it, they can special order it for you. Check with Needle in a Haystack. 5. A little (4mm) faceted amethyst bead. You probably won’t find it hard to believe that I’ve got another practice piece going. I’ll show it to you a bit later. 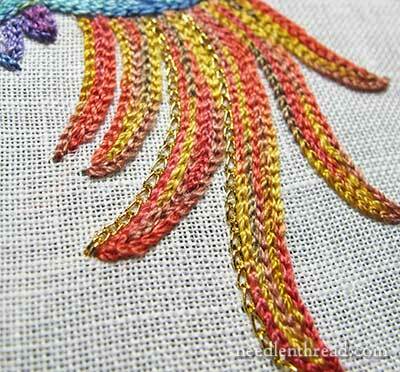 It involves “shading” with tambour embroidery. We’ll be reviewing an excellent book on tambour embroidery this week, too, for those who are looking for simple, clear, uncomplicated, solid instructions in tambour embroidery. 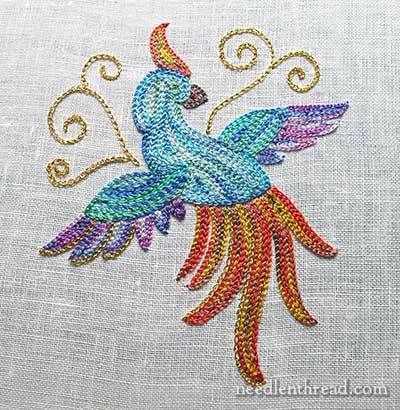 You can find more information, tutorials, resources, and other tambour embroidery works in this Index for Tambour Embroidery here on Needle ‘n Thread. Miss Gertie McFuzz has come alive I love the gold and the beaded eye definitely gives her personality, the added goldwork also enhances the piece it’s lovely. I wonder what you will do with the piece now it’s completed it would look nice on the top of one of those boxes from Sudbury House. I can’t wait to see the shading piece and the book review. Thanks for showing us Miss Gertie. Glamorous Gertie wouldn’t have been glamorous without her bit of gold. A bit of practice with the gold needed doing too, so it wasn’t a waste at all. The colors all look very good together – she could be a gift to someone for Christmas if you don’t have anywhere for her to live in your house. I like how she turned out, I may try to do her up with a few more sparkly bits and beads, make her a Christmas themed bird. Thanks so much for this info. Waiting anxiously for the “must have” book on tambour. Gertie is very cute. I like that her beak isn’t perfect since animals and humans may have an imperfection according to the scale of beauty that we all draw from. That is what makes her unique. 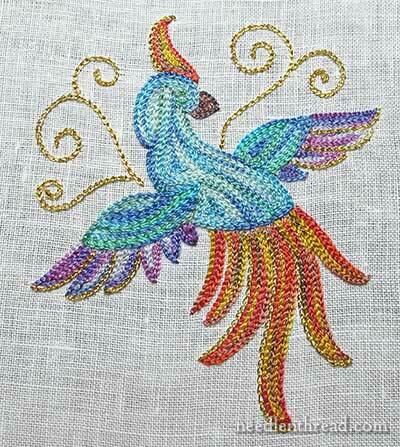 Thanks for sharing some great stitching fun with us all. Well she couldn’t have gotten it from her moms hummingbird side of the family. That is where her wings came from. 🙂 She is quite lovely by the way. Love Gertie! 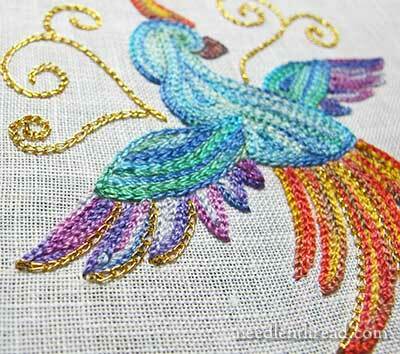 This really makes me want to try Tambour embroidery now. Miss Gertie is absolutely gorgeous, Mary. I am very much waiting for your tambour classes. One droopy-drop feather. That’s all that she had. And, oh! That one feather made Gertrude so sad! And gave Gertie a lovely blue head. She soon became one of Mary’s favourite things. But when standing back Mary thought she looked cold….. So warmed her up with lashings of gold!!!! Brilliant, Liz! 🙂 thanks for the smile! The eye makes ALL the difference. Gertie turned out very cute. Can’t wait to get my needles. Mary, that gold tamour thread really made the whole composition work. Gertrude is beautiful. I didn’t like the beak until seeing the pic where you added the eye. That made her have a personality. She’s cute! Thanks for posting this project. I’ve learned so much. I can’t wait to see the next one. It is beautiful….I really love it. She’s looking at Mary without any fear. No more sticking and jabbing, she’s very relieved! Gertie McFuzz can soar high above. Wow! Gertie’s taken flight beyond all expectations! That touch of gold and the wee amethyst eye? YES!!! She’s lovely! The gold really makes her pop, and the bead makes a perfect eye. A lot of personality in this practice piece! She’s wonderful! I would love to make her; you call her a practice piece,but I think it’s a lovely work of art. Will you be making the pattern available? She’s so pretty, Mary-what will you do with her? She deserves to have a spot! A place to be and to be admired! Mercy me…every time you introduce a new (to me) stitching method or type, I just want to jump in, needle first, and DO IT! But, I look at my stash…for pete’s sake-MY STASH!! I’ve got to finish what I’ve started-just got to. Thank you Mary for just being there every day since my husband died. I’m still weaving my way through the madness that bereavement becomes, retiring at the end of the year from the job that kept me sane through the last two dark years and always being inspired by your work. Reading your bright comments every day and knowing that whatever shape the day takes, there will be another project from you and a cheerful comment on the next one has meant, like in everything, it’s just one step at a time. I like gertie – I do enjoy a bit of extemporizing now and again. I have a real Thing about eyes. If I am doing a person or animal, I have to work at the project as quickly as possible so that I can put the eye in. I find eye-less figures — not creepy, exactly… more “accusatory”. Like they are unhapy with me for leaving them blind. Once the eye is in, the figure or animal becomes my friend and the whole process becomes more relaxed. Is that a bit crazy of me? I suppose it is. Nice work. I think with her eye, the beak doesn’t look so like Cyrano de Bergerac’s promontory of a nose. She looks very nice and ready to fly. Gertie has definitely ‘glitzed’ up the place. She really is lovely and the gold just makes the whole thing ‘pop’. I am so glad you’re continuing to offer us more information about doing tambour work. I’ve gotten as far a acquiring the hoop and hook. Each of your articles encourages me again and enlightens me further. You have given me the courage to try tambour work. I have ordered my hook and I’m going to give it a try. I am in the process of working on two church pieces to complete an antique vestment. 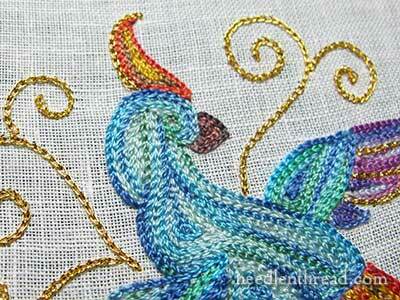 It was worked entirely in Beauvais stitch, but I worked the first in traditional chain stitch. It took a short lifetime to complete. So, for the second piece, I’m giving the hook a whirl. I’ll keep you posted. Thanks for your input, as usual. Your work is divine! Next Next post: Mission Rose: Big Gold Thread!